Descending from the upper gallery at the Hagia Sophia, I caught the crew through the column. Today was the Hagia Sophia. It’s hard to convey in tiny IG photos the magnitude and impressiveness. Built in 532-537AD, it is now a museum and serves as a historical example of the many religions that ruled here. An architectural wonder. Had a lovely meal this evening, including a traditional clay pot entree. A great find with a lovely host that put up with my attempt at speaking Turkish. Day two - Hippodrome, the Blue Mosque, Gülhane Park, Roman Cistern. Labor Day weekend found us visiting some places in the Rutherford and St. Helena AVAs. Since it was hot out, I was seeking some nice chilled white wines to add to my cellar. Elizabeth Spencer – Rutherford AVA, wines sourced from various regions. I had visited E.S. a few years ago, back when they were first getting started in their current location of the old Rutherford Post Office. They have grown since then, and the current staff has this place riding high on my list of wineries to recommend. Tracy and Dave were excellent hosts, and had me feeling like they were that favorite aunt or uncle of yours that could get away with saying anything and had a great humor to boot. E.S. has a Mendocino County Sauvignon Blanc that was good, with a hint of oak on it. They also had a Rosé of Pinot Noir from Sonoma that was crisp and refreshing. Easy drinking wines all around. Overall, their wines are 3.5/5. Heitz Cellars – St. Helena AVA, this winery is a hallmark in Napa. Tracy from Elizabeth Spencer recommended we try their Grignolino, an Italian varietal known for its wild strawberry profile. Heitz makes a red and a rosé with this, and holy cow was it delicious. And cheap! $21, 4/5. Corison – One of the top winemakers in the valley today, Cathy Corison is running a no-nonsense operation that’s putting out some very delicious wine. The portfolio isn’t huge, but these days I have come to see that as more of an asset. Cathy knows cabernet sauvignon, and with the estate vineyard in the St. Helena AVA, her cabs are firing on all cylinders, in my book. There’s a reason her Kronos is garnering rave reviews and awards. She concentrates her cabs using the saignée method, a French term describing the bleeding off of some of the grape juice to enhance the skin to juice ratio. Fortunately, the juice that’s bled off makes a very lovely Rosé of Cabernet Sauvignon. $30, 4/5. She also puts out a dry Gewürztraminer that is just as delicious. $30, 4/5. I’ll be finally making a trek to pay homage to the “Father” of Napa’s winery: Robert Mondavi. I also have a Summit Tasting scheduled at Pride Mountain Winery – my 3rd Summit tasting with them. It should be a good day, as I will be hosting my cousin and his lovely wife. Anyway, I’ll report back with my thoughts on the wines. 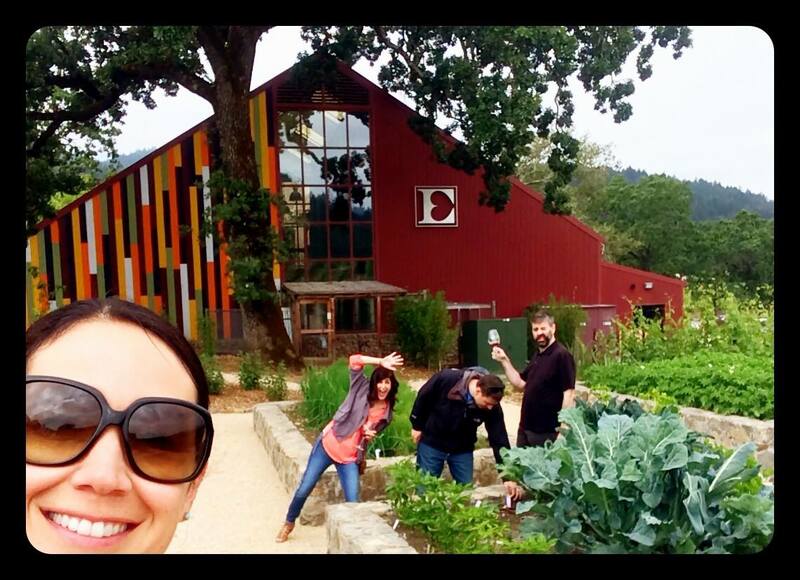 This past Saturday I took a group to visit Napa and our first stop was Ram’s Gate Winery. This winery has a great presence – gorgeous architecture and appointments, and a decent view. Unfortunately, the experience with the employees leaves me wondering what the mission of Ram’s Gate is: a winery producing very good wine to share with potential customers – or to be a close destination from San Francisco to have a mediocre experience, and pay through the nose for it. The group of us, at Ehler’s Estate.